Provide your residents and physicians with efficient access to medical knowledge, educational resources, and a host of collaboration tools designed to improve patient outcomes through information access, sharing, and communications. Create and share a comprehensive, multi-media reference library of medical Journals, white papers, newsletters, videos, and interactive case studies between different hospitals and medical societies. Information accessible via the Web and virtually all smart phones, tablets, and computers. A networking system for all participating programs which will allow collaborative exchange of information between institutions. An HTML based webpage builder for residents to generate/share multi-media notes for study. A “Virtual Journal Club” – a technological version of an established institutional product. Powerful search engine with specialty-specific tagging and filters, even search inside videos. Ability to bookmark specific points inside of videos (including YouTube or Vimeo). 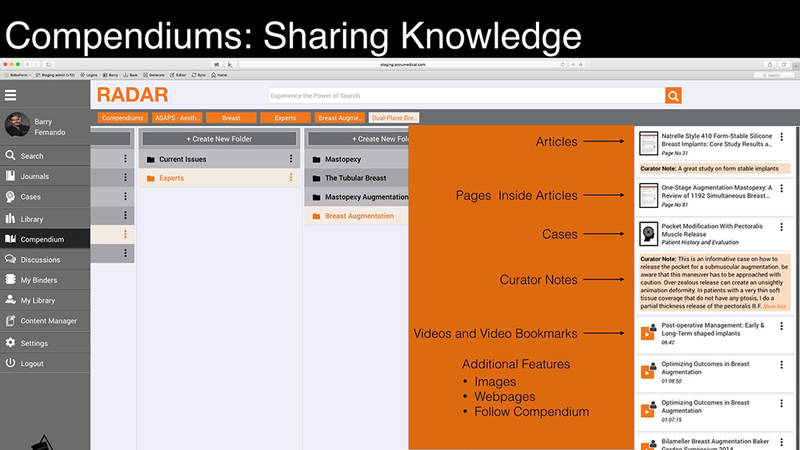 Access to Compendiums which are expert generated folders of information on techniques, problem management, etc. Customized Enterprise Search: Provides instant access to the most highly relevant information from all content and sources including publications, discussion threads, interactive case studies, and even inside bookmarked videos. AnzuMedical Features: Unique, Powerful, Fast, Intuitive.